Americans have a voracious appetite for TV entertainment, and the Trump reality show—guest starring outraged Democrats, power-hungry Republicans, and a hodgepodge of other special interest groups with dubious motives—feeds that appetite for titillating, soap opera drama. After all, who needs the insults, narcissism, and power plays that are hallmarks of reality shows when you can have all that and more delivered up by the likes of Donald Trump and his cohorts? Trump is inclined to denounce any news agencies and reports that paint him in a less than favorable light as “fake news,” which leaves only the Fox News channel to carry the president’s torch for media integrity. Yet as John Lennon reminds us, “nothing is real,” especially not in the world of politics. In other words, it’s all fake, i.e. manufactured, i.e. manipulated to distort reality. Indeed, the political scene in the United States has devolved over the years into a carefully calibrated exercise in how to manipulate, polarize, propagandize and control a population. This is the magic of the reality TV programming that passes for politics today. As long as we are distracted, entertained, occasionally outraged, always polarized but largely uninvolved and content to remain in the viewer’s seat, we’ll never manage to present a unified front against tyranny (or government corruption and ineptitude) in any form. The more that is beamed at us, the more inclined we are to settle back in our comfy recliners and become passive viewers rather than active participants as unsettling, frightening events unfold. Reality and fiction merge as everything around us becomes entertainment fodder. We don’t even have to change the channel when the subject matter becomes too monotonous. That’s taken care of for us by the programmers (the corporate media). “Living is easy with eyes closed,” says Lennon, and that’s exactly what reality TV that masquerades as American politics programs the citizenry to do: navigate the world with their eyes shut. As long as we’re viewers, we’ll never be doers. Studies suggest that the more reality TV people watch—and I would posit that it’s all reality TV, entertainment news included—the more difficult it becomes to distinguish between what is real and what is carefully crafted farce. 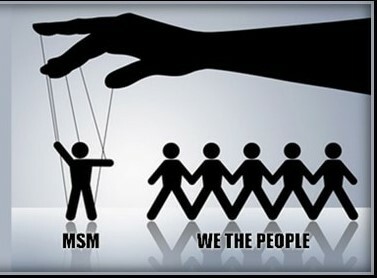 “We the people” are watching a lot of TV. This doesn’t bode well for a citizenry able to sift through masterfully-produced propaganda in order to think critically about the issues of the day, whether it’s fake news peddled by government agencies or foreign entities. Look behind the political spectacles, the reality TV theatrics, the sleight-of-hand distractions and diversions, and the stomach-churning, nail-biting drama, and you will find there is a method to the madness. We have become guinea pigs in a ruthlessly calculated, carefully orchestrated, chillingly cold-blooded experiment in how to control a population and advance a political agenda without much opposition from the citizenry. This is mind-control in its most sinister form. Truth is often lost when we fail to distinguish between opinion and fact, and that is the danger we now face as a society. Given the preponderance of news-as-entertainment programming, it’s no wonder that viewers have largely lost the ability to think critically and analytically and differentiate between truth and propaganda, especially when delivered by way of fake news criers and politicians. While television news cannot—and should not—be completely avoided, the following suggestions will help you better understand the nature of TV news. 1. TV news is not what happened. Rather, it is what someone thinks is worth reporting. While viewers are often inclined to take what is reported by television “news” hosts at face value, it is your responsibility to judge and analyze what is reported. 2. TV news is entertainment. There is a reason why the programs you watch are called news “shows.” It’s a signal that the so-called news is being delivered as a form of entertainment. Although the news items spoon-fed to you may have some value, they are primarily a commodity to gather an audience, which will in turn be sold to advertisers. 3. Never underestimate the power of commercials, especially to news audiences. In an average household, the television set is on over seven hours a day. Most people, believing themselves to be in control of their media consumption, are not really bothered by this. But TV is a two-way attack: it not only delivers programming to your home, it also delivers you (the consumer) to a sponsor. 4. It is vitally important to learn about the economic and political interests of those who own the “corporate” media. Even those “fake” news outlets denounced by Trump are enjoying significant sales and ratings boosts as a result of Trump’s so-called war on the media. In other words, to a dying news industry, the Trump presidency has been great for business. 5. Pay special attention to the language of newscasts. TV by its very nature manipulates viewers. One must never forget that every television minute has been edited. 6. Reduce by at least one-half the amount of TV news you watch. Do not form your concept of reality based on television. 7. Watching TV news gives the illusion of participation in American life. Americans should beware of letting others—whether they be television news hosts, political commentators or media corporations—do their thinking for them. As I make clear in my book A Government of Wolves: The Emerging American Police State, a populace that cannot think for themselves is a populace with its backs to the walls: mute in the face of elected officials who refuse to represent us, helpless in the face of police brutality, powerless in the face of militarized tactics and technology that treat us like enemy combatants on a battlefield, and naked in the face of government surveillance that sees and hears all. It’s time to change the channel, tune out the reality TV show, and push back against the real menace of the police state. If not, if we continue to sit back and lose ourselves in political programming, we will remain a captive audience to a farce that grows more absurd by the minute. My Upcoming Barnes & Noble Booksigning! US Foreign Policy: Another Inconvenient Truth? Rethinking what “National Security” Means. T.L Mumley on Normalize Peace rather than Violence! Smashwords: Buy in eBook format!